Lower back pain is a common condition, but for some people it can be disabling. 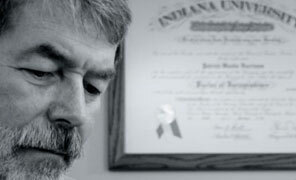 In 2003, an Indiana man went to a doctor of osteopathy in Bedford, Indiana, seeking to relieve his lower back pain. The doctor recommended vertebral fusion surgery. Where medically appropriate, this procedure is done to reduce the patient's range of motion in the painful area by physically fusing certain bones of the spine (vertebrae) together with screws. He expected to enjoy substantially less lower back pain upon recovery from the procedure. Unfortunately, the surgery left him with far more debilitating pain than ever. In medical malpractice cases, one of the biggest challenges can be the doctor's refusal to admit anything went wrong. In this patient's case, the doctor of osteopathy claimed that a CT scan showed no problems — even though the patient said he was in excruciating pain. As many lawyers know, you can prove a doctor wrong, but you often need another doctor to do it. In this case, a neurosurgeon was able to show that one of the surgical screws used to fuse the vertebra had been installed improperly. In fact, the screw was in direct contact with a nerve in the man's back. With essentially a foreign object pressing that nerve, the man was left with a permanent, disabling stabbing sensation in his lower spine. The man had to undergo multiple additional surgeries. Columbus, Indiana, attorney Patrick (Woody) Harrison helped the man get the evidence he needed to prove the original osteopath's mistake. He took the case to trial March 2008, and a Lawrence County jury delivered a $648,000 verdict for the client.